With the trade of Demetrious Johnson and the releasing of numerous flyweights, the UFC flyweight division is on its way out, and T.J. Dillashaw is there to lock the door and turn out the lights. “The UFC wants to get rid of the division and they hired me to go down and close it and get another belt in the process,” Dillashaw said to Ariel Helwani. The fight set for UFC 233 in January will see Dillashaw drop from bantamweight to flyweight and face off with current champion Henry Cejudo. Cejudo ended one of the most prolific streaks in MMA history when he defeated Demetrious Johnson earlier this year, but now Dillashaw looks to claim the division as his own. 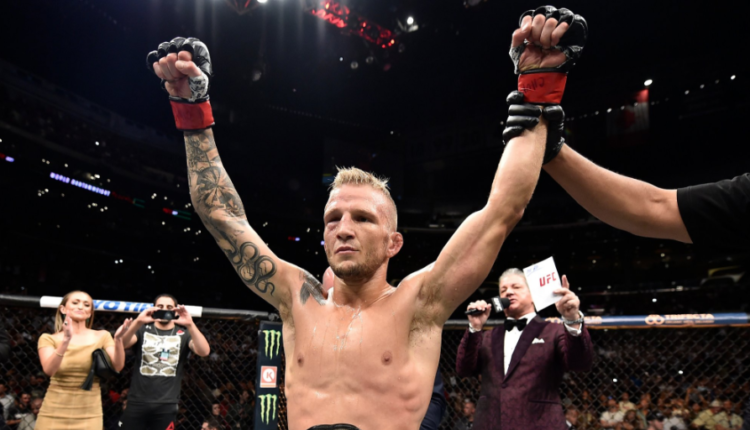 Dillashaw has been calling for flyweight title fight since 2017, wanting to fight then champion Demetrious Johnson, but would be denied by the then champion in-lieu of a fight with a natural flyweight. Now with Cejudo as the titleholder, the deal would be made and Dillashaw has begun the process to be the last man to hold the UFC flyweight title. “I’m already starting the process, already working on it,” said Dillashaw. “It’s gonna be better this way, anyway, because there’s no excuse. No excuses that I’m the bigger man, that I’m bigger when I’m fighting him. Because I’m gonna come down and make the weight.